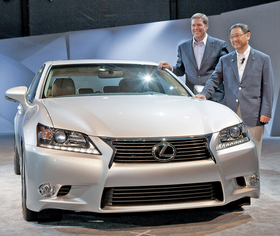 Lexus executives convinced Toyota President Akio Toyoda, right, not to cancel plans for the redesigned GS 350. Toyoda also decided to give the luxury brand greater influence in corporate decisions. That means U.S. Lexus boss Mark Templin, left, and other execs will have more say. MONTEREY, California -- Eighteen months ago, Toyota had all but scrapped its plans for the redesigned Lexus GS 350 sedan that was unveiled here last week. At the time, the company was pouring engineering resources into resolving its unintended acceleration crisis and was busy changing quality and safety procedures. Plus, the GS' underwhelming sales in the United States and Europe made for a weak business case against the Mercedes E class and BMW 5 series. Toyota Motor Corp. President Akio Toyoda had put the GS on the chopping block, but a last-ditch effort from U.S. and European executives saved the car. In the process, the company overhauled the way Lexus executives report to top management in Japan -- giving the luxury brand a stronger voice at the highest levels of the company. "I didn't want this car," Toyoda said at the debut of the GS, which goes on sale in early 2012. But Lexus' regional management teams "fought me like crazy." 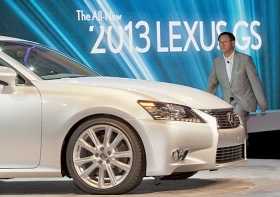 Several top Toyota executives confirmed that the 2013 GS redesign had been as good as dead. "There were some executives, including Akio, who thought, in terms of our priority list, that the GS should be delayed or canceled," said Andrew Coetzee, now U.S. vice president of Lexus Brand Development. He was a Lexus product planner in Japan at the time. Coetzee says Toyoda's pessimism resulted from the many layers of Japanese executives through which Lexus' overseas managers reported. Only when Lexus' global team members appealed directly to Toyoda did the boss change his mind. Company officials say Toyoda decided there was a flaw in the system. As part of the company's management reorganization in April, he created a new reporting structure that gives Lexus more influence. Previously, at least four layers of r&d, sales and marketing executives in Japan separated Toyoda from overseas executives responsible for the Lexus brand. But a new Lexus Product and Market Planning Division was formed with a direct line to Toyoda. The division is headed by Japan-based executive Karl Schlicht, who reports to managing officer Kiyotaka Ise. Ise, whose only responsibility is Lexus, reports to Toyoda. Coetzee admitted that "things were not done well" with the current bland and bloated GS, and that the lineup was "missing something" between the entry-luxury ES and IS sedans and the flagship LS. The GS needed to represent "a premium car with premium chassis technology ... a step up in dynamics and status." The GS has been a continual underachiever compared with the 5 series, E class and Audi A6. The current generation's sales peaked at 27,390 units in 2006, tapering off to 7,059 last year. But the redesigned 2013 GS displays the sheet metal and interior design cues that will carry across the brand for the next several years. "The GS may be low volume [in the past], but it is symbolic of the new Lexus," said Yoshi Inaba, CEO of Toyota Motor Sales U.S.A.
Toyota President Akio Toyoda unveiled the redesigned Lexus GS 350 in Pebble Beach, Calif., last week. The new sedan will go on sale in the U.S. early next year. Lexus says the 2013 GS 350 uses an all-new platform with a 2-inch wider track. Its wheelbase remains the same, but the car is longer, wider and taller than the old model. The GS will be offered with only a V-6 and V-6 hybrid. A V-8 version was part of the previous two generations, but was only about 10 percent of the model mix. Using a carryover 3.5-liter V-6 and six-speed sequential-shift transmission, the GS 350 accelerates from 0-to-60 mph in 5.7 seconds, the same as the current model. The GS will still be offered in rear- and all-wheel drive versions. The GS' front suspension remains mostly unchanged but uses larger bushings. The rear subframe has been redesigned, with new geometry for its multilink suspension. Unlike the concept car that debuted at the New York auto show in April, the GS' front fascia does not use a grille that extends uninterrupted from the hoodline to the chin spoiler. Instead, the trapezoidal "spindle" grille is interrupted by a horizontal strip that carries through from the bumper. As for its overall appearance, the GS looks more like a big brother to the sporty IS sedan. The hybrid version will be unveiled at the Frankfurt auto show next month. An F-Sport model, equipped with a suspension and body package, and possibly a supercharger, will be seen at the Specialty Equipment Market Association show in November in Las Vegas.